His artists’ website, Back Door Art, says that “John Moran is a politically and socially engaged hot glass sculptor, mixed media artist, studio co-founder and operator at Gent Glas, and all around nice guy.” I found all of this to be true in a recent conversation I had with him to learn more about his work and the contribution Gent Glas is making to the Gent community. Here is a summary and some excerpts from our conversation. Perhaps the obvious first question for John is, why is he “Sleepy”? He earned the nickname in the very first glass class he ever took. At the time, he was working a night shift job and going to school during the day. The exhaustion would catch up with him in the warmth of the glass demonstrations and he would fall asleep. John Moran and his dog, Kaiser, preparing the Gent Glas studio for a Friday Night Live. In our conversation, John more frequently called himself a nomad. Whether we call him an expat or a nomad, moving has appealed to him. He grew up and attended art school in Philadelphia, Pennsylvania in the United States. Following art school, he traveled all over the U.S. He then spent a year and a half teaching English in China. 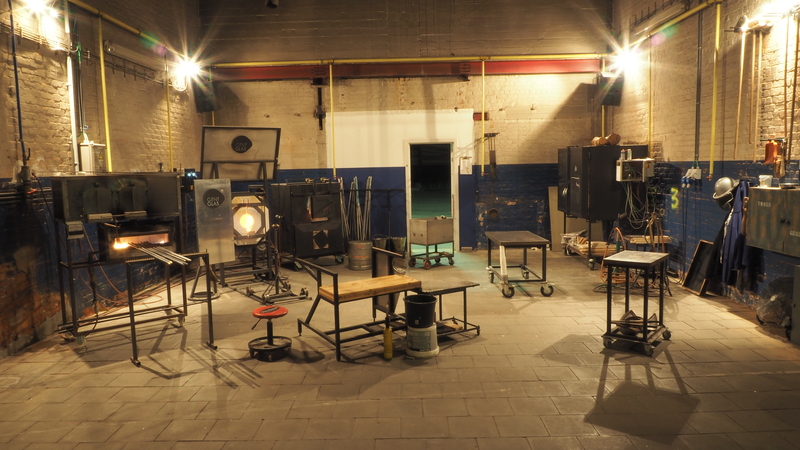 After returning to the U.S. to resume work blowing glass, he befriended a Belgian glass maker. She invited him to do a residency and to teach in Belgium in 2010. He traveled between Belgium and U.S. frequently, finally moving here in 2013. John has brought with him some characteristically American traits: a sense of openness and hospitality, a creative and entrepreneurial approach to his business that fuels his artistry, and a community-building spirit. These traits may stand out in Belgium, but they are the driving force making Gent Glas successful. After moving to Gent in 2013, John co-founded Gent Glas with three Belgians to have a place to create his art. While some of the colleagues have changed over time, John has remained the consistent operator, and heart and soul of Gent Glas. How and why was Gent Glas founded? That team now consists of about 20 artists. They are a group comprised of full-time, part-time, and temporary artists and interns, currently hailing from Belgium, France, Netherlands, Poland, South Africa, and the U.S.
How else has Gent Glas evolved? 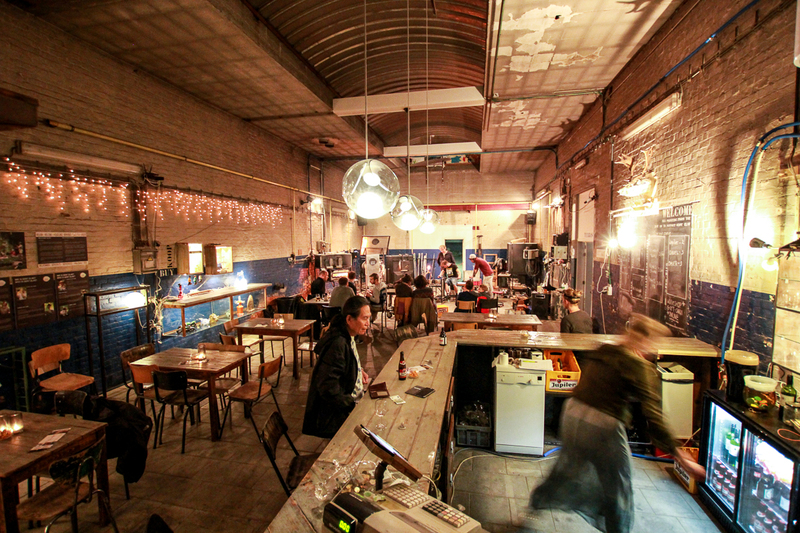 The café and studio at Gent Glas. Photo courtesy of Gent Glas. How can people experience and support Gent Glas? The studio at Gent Glas. Photo courtesy of Gent Glas. The studio is also available to rent for special occasions, team-building, parties, and more. I love your Inferno beer glasses. I drink everything out of them! You offer a lot of activities and services. Is there anything else people should know about Gent Glas events? As artists, do you differentiate between your personal art and the products for Gent Glas? 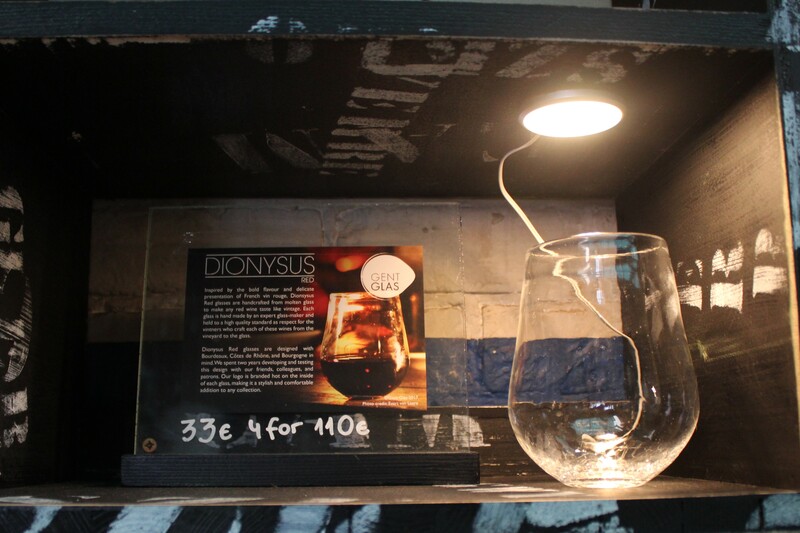 Gent Glas’s Dionysus drinking glass. You offer a variety of ways for consumers to support your business. I would say that is a very American approach to business, would you agree? Is it working here in Gent? How has Gent been for you as an entrepreneur? and small business owner? and freelance artist? 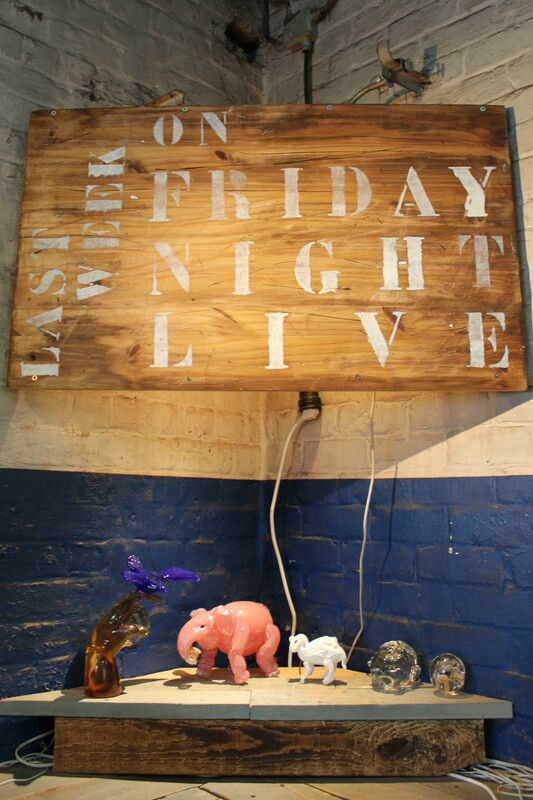 A display of art made in the Gent Glas studio during a Friday Night Live. We talked about some of those challenges, including language barriers, complicated tax laws, confusing paperwork, and limited opportunities for artists. John has experienced all of the above. Despite these challenges, it seems like Gent Glas is doing well? 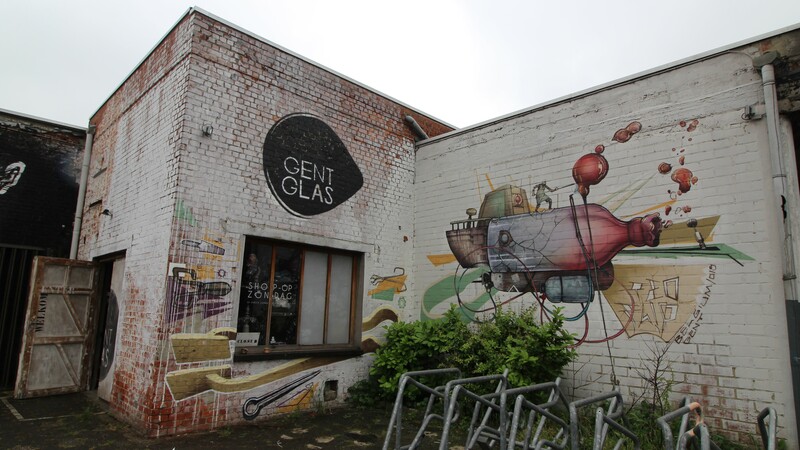 As a cultural organization, how does Gent Glas contribute to the city and community? 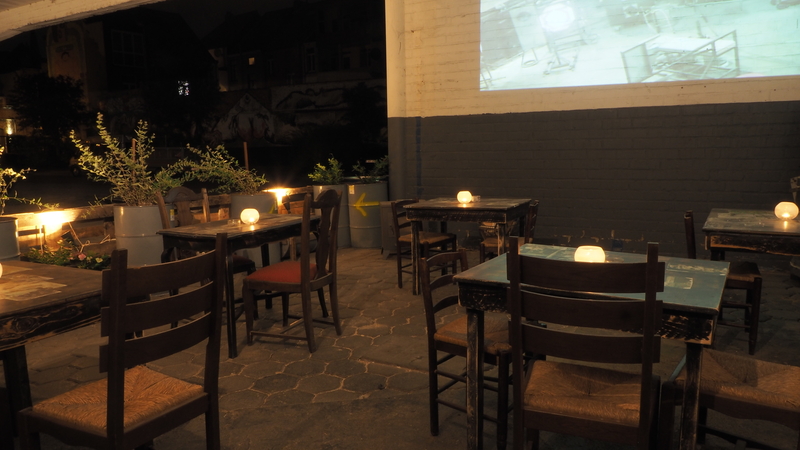 The terrace at Gent Glas. Photo courtesy of Gent Glas. What are your hopes for the future of Gent Glas? What else do you want The Square.Gent readers to know about Gent Glas? Maybe it is just the American in me that really appreciates the warm hospitality, but I think he is absolutely correct, Gent Glas really is a good place to be! 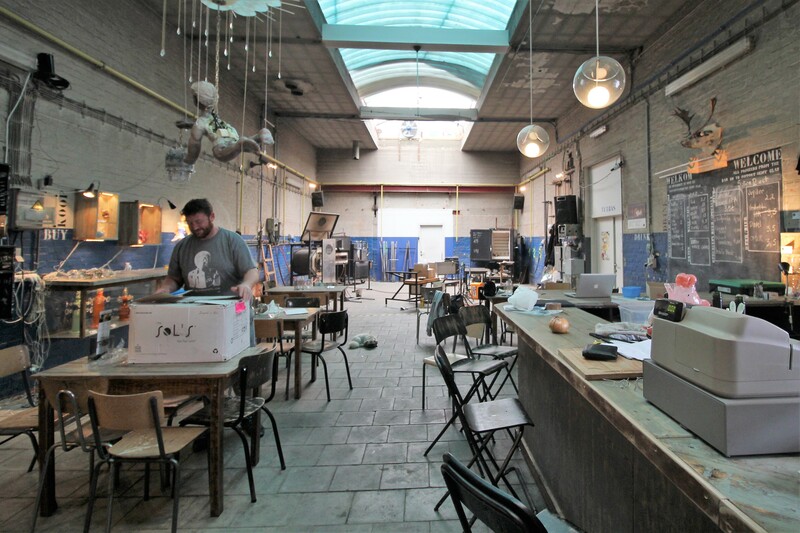 In starting Gent Glas, John and his co-founders and fellow artists have created an open, community space where artists and the public can meet. It is a place where, with public support, he and other artists can flourish, and we can all benefit. But don’t just take my word for it. Go visit, see for yourself, and support Gent Glas! 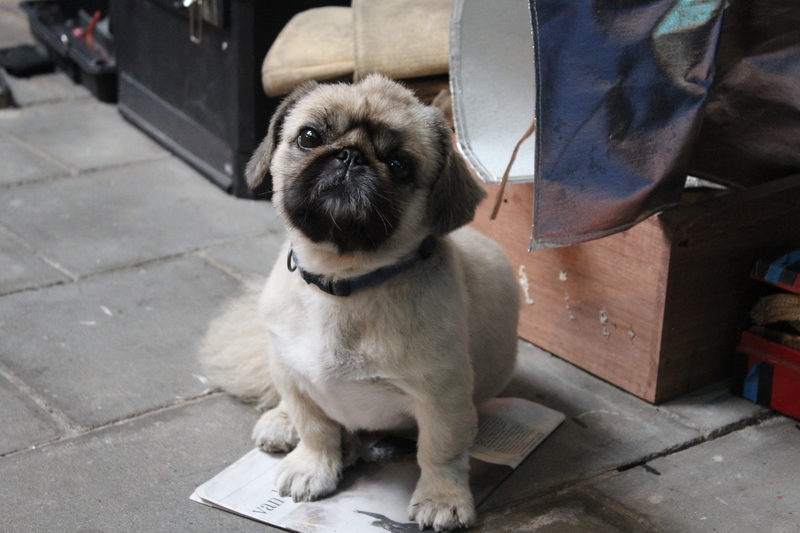 Kaiser, the studio dog, is ready to welcome you at Gent Glas. You will be graciously welcomed by Kaiser, John’s dog! John says it is very rare that people break glass objects in the shop and studio. Be careful and keep that record going! The team at Gent Glas built (upcycled!) 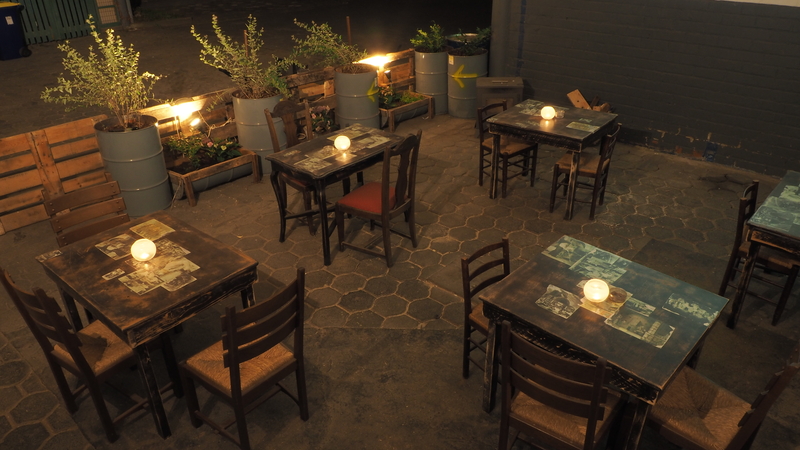 their bar and café furniture from a “trash heap” of materials found when they moved in the building.